A black leather corner sofa conjures up a picture of opulence and here at RJF Furnishings we have the Washington black (also available in brown and red) leather corner sofa available to you today at an amazing price with outstanding quality. The Washington leather corner sofa suite is also available in brown leather so if you feel that perhaps black leather is not your colour then opt for the sumptuous brown leather instead. You won’t be disappointed because this sofa is upholstered in a soft cut of premium bonded leather and all of the non facing panels have a black leather match. It is soft to the touch and exquisite to sit on. The Washington black leather corner sofa has a modern edge to it because of its boxy corners but it could take pride of place in a family home, office, study or bachelor flat. It is that versatile. The Washington has pocket sprung seating for your comfort and the back cushions are generously padded for added enjoyment. You will be amazed at the quality of this black leather sofa for the price that you pay. It can be distributed quickly and you can choose which corner orientation you prefer, left hand or right hand facing. The Washington really is value for money so don’t think that because it is a cheap sofa in terms of cost it will be cheap in terms of quality. If you are in any way disappointed we will gladly refund you 100% of the cost, no questions asked. 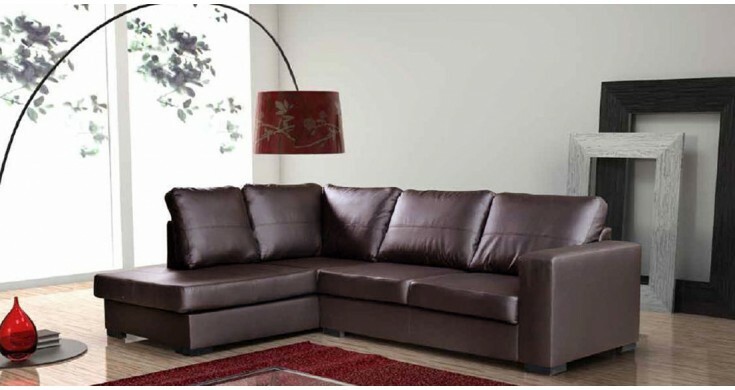 So purchase the Washington black leather corner sofa today and make it the focal point of your living room.